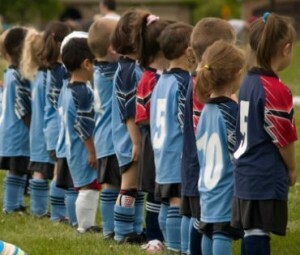 Outside of work, I spend many hours coaching my kids and other parents’ kids in school and community sports. There is a lively debate right now in the youth sports community about the value of focusing exclusively on a single sport from a young age. I wrote on the topic in a 2012 post on the Multi-Sport High School Athlete, and in 2013 on Being a Sports Parent Today. Part of what really draws me to this challenge in youth sports are the parallels and similar debates in education. I find the conversation around sports and whether we should be keeping score and ranking players and teams from youth, akin to the conversation around the purpose and appearance of elementary school report cards. Letter grades are very much like keeping score; those who argue for them remind us of the competitive nature of the world we live in and the need to let kids know where they stand, with those opposed contending the real competition is with oneself, learning and improving skills and the relative comparison to others is really secondary. I also find the challenges for new providers in the youth sports game very similar to what has happened and is happening in education. A generation ago it was the local community sports associations who were organizing youth sports. If you wanted to play hockey, soccer or basketball there was really only one option available. Now, there are dozens — traditional community providers sharing the stage with other non-profit organizations, for-profit enterprises, as well as a series of new sport providers in as many sports capacities. Similarly, in education we see public education challenged by independent schools for market share, and even less traditional options for learning like for-profit tutoring companies and completely virtual options like the Kahn Academy. Youth sports, like learning options for young people, is in a time of transition — and it is part of what makes it an exciting time. With that as a backdrop, here are my recent comments I shared for an article by Don Fennell, Sports Editor for the Richmond Review, Year-round sports mode: top athletes, coaches share their thoughts. I have also included the comments of my wife and oldest daughter on the topic from the article because the thoughts are really ‘all in the family’. The shifts happening in youth sports are far more complex than just being good or bad, says educator Chris Kennedy, who is also a former president of the B.C. High School Boys’ Basketball Association. Kennedy says the related debate with increased early specialization is whether sports should be more or less “score-focused” at younger ages. He thinks youth soccer and basketball have it right: de-emphasize scoring at younger ages and focus on development. Kennedy’s wife, Stephanie, is equally passionate about the topic. She has always believed that kids should be exposed to and participate in as many different sports as possible while they are young. And for a variety of reasons. Stephanie, who runs Panther Cheer Athletics, is also adamant that kids participating in as many sports as possible when they’re young aids their physical development. This doesn’t mean, she says, they must do multiple sports at the same time, but within a calendar year should shift from one activity to another. The eldest of the couple’s four children, Elizabeth, 12, thinks those who focus on one sport may quickly tire of it, burn out and then have no other alternatives. The entire article is worth a read here. It is interesting that there is general consensus from all those interviewed of the value of young people playing a range of sports. So, I am left wondering, if we all believe this to be the right approach why then is this topic such an issue? I think we may know it to be right on the theoretical level, but in the heat of “keeping of with the Joneses” we have trouble letting our actions reflect this approach. From time to time I have taken some of Seth Godin’s ideas and have related them to an educational setting. In previous posts, I have written about Alienating the 2%, Thinking of School as an Experience, and the Pleasant Reassurance of New Words. Not your job title, but your job. What do you do when you’re doing your work? What’s difficult and important about what you do, what change do you make, what do you do that’s hard to live without and worth paying for? If your only job is “showing up,” time to raise the stakes. As a teacher, part of my job was to ensure my History 12 students did REALLY well on the government exam. I also thought my job was to ensure students were interested in pursuing more learning opportunities in English, Law and History after taking the class (hopefully) than before taking it. I also thought part of my job was to add value and create community beyond what students could find in a textbook or on the Internet. Now, as superintendent, I think my job is to keep us moving in the right direction. And there are so many moving parts — from politics and labour issues to new curriculum and pedagogies. So, part of my current job is to ensure our district is more than a collection of independent contractors who share a common location. It can be challenging and it is always a balancing act — pushing and supporting, giving attention to one area at the expense of another and then readjusting the whole. It would be interesting, if not challenging, to put a one-sentence reply on “what we do” on an organizational chart. So, back to where I started and “What’s your job?” There are so many different, innovative and fitting ways to do the job. The more superintendents I meet and come to know, the more I am impressed by their approach to leadership and how they have taken ownership of the ‘job’. The person who will follow me will make the job theirs and it will likely look very different from what it is now. Also likely, the people around them will have different approaches and facets to their jobs. Several highly accomplished superintendents in West Vancouver have shown us this through the years. I think part of what is exciting and can also drive one crazy about education: is there one inclusive and all-encompassing answer to the “What’s Your Job” question? 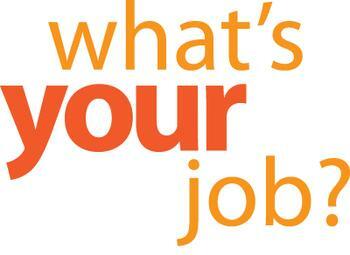 I am curious to know what others see as their “job”. Kids Today . . . Some Good News! There are observations often made about young people today. Young people today are “taking more risks” or “using more drugs”. The observation becomes generalized that young people today are “just not as good” as young people of the past. The observations are insinuated quietly and, as isolated incidents emerge, they become referenced through the media in a way to punctuate the negative narrative. More observations are then made about why the incident has happened; maybe it is all the video games, or a shift in societal values, or that we are raising a generation of young people who are just not quite up to standard of those before them. 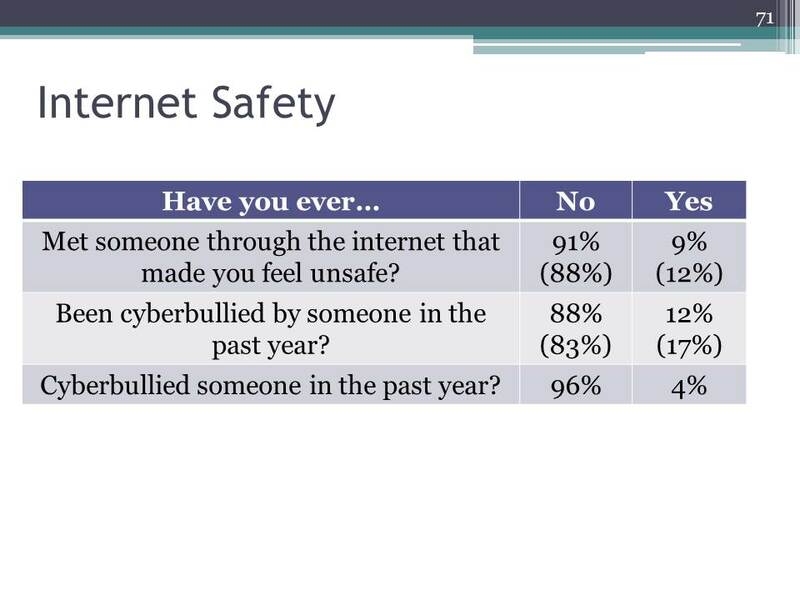 Well, this is where the latest survey results from the McCreary Centre Society become interesting. The McCreary Centre Society “is a non-government, non-profit organization committed to improving the health of B.C. youth through research and community-based projects.” Since 1992, they have had students complete surveys on a range of topics related to comprehensive school health. The latest results published this year are the fifth such set of results based on the surveying of about 30,000 students in Grades 7 to 12. Results show that youth are generally making better choices about risk behaviours than they have in previous years. 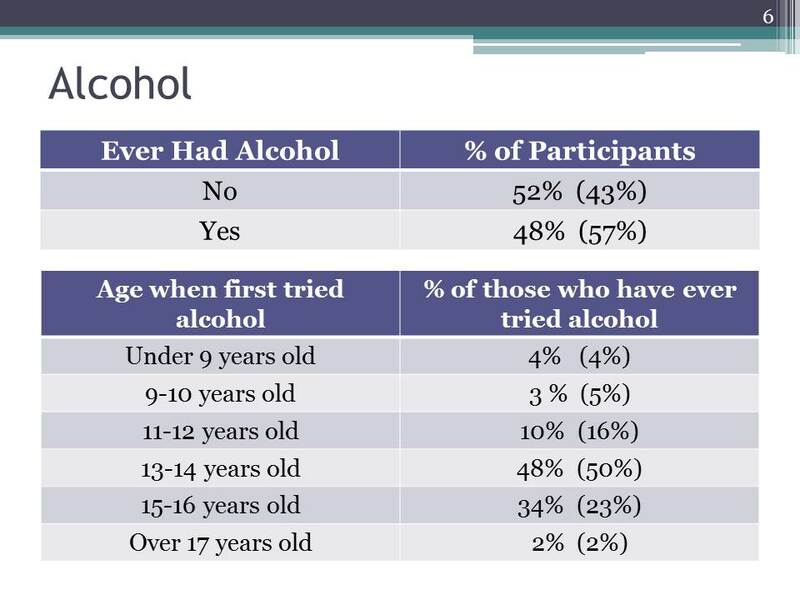 For example, a lower percentage of students reported having tried tobacco, alcohol, marijuana, or other substances than their peers five and ten years ago. They were also more likely to engage in injury prevention behaviours, such as wearing a seat belt and not driving after drinking. These choices may also be reflected in better health outcomes: students were less likely to have had a sexually transmitted infection or to have been pregnant or caused a pregnancy, and a smaller percentage reported serious injuries than in previous years. Other encouraging news from the survey included a decrease in the percentage of students who had been physically or sexually abused, as well as in the percentage who had been sexually harassed. Now, that is a story that just doesn’t fit in with the observations. In fact, the kids today are actually doing pretty good. The McCreary data is exceptionally useful for school districts in our planning processes. We have already spent quite a bit of time dissecting data and there is more time that will be spent still to come. With thanks to Maureen Lee, our District Administrator (all data charts and graphs below are Maureen’s) we are looking at current areas of strength, concern and noticeable trends. The “%” listed is for 2013 and the “%” bracketed is for 2008. 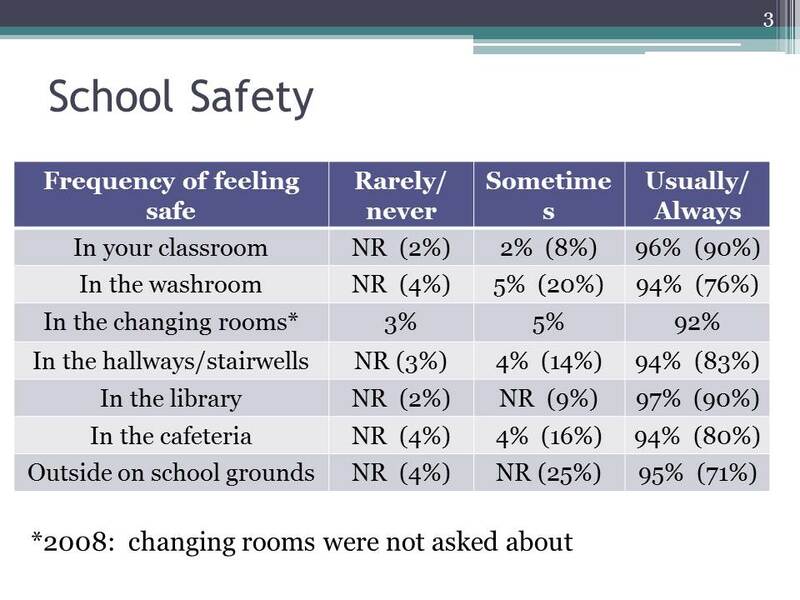 In all areas of the school, students are reporting they are feeling more safe and the numbers reporting they feel safe “Usually” or “Always” is over 90 per cent. As we look at substance use the statistics are flat for marijuana, with three in 10 young people every having used it; tobacco use is slightly less with one in four having tried smoking. Of other drugs, it is prescription pills that still standout — although down from 17 per cent in 2008, the number is still at 10 per cent. This has been a concerted area of work in our community with the school district working with West Vancouver MP, John Weston, the West Vancouver Police Department, as well as other partners to raise awareness on this issue. 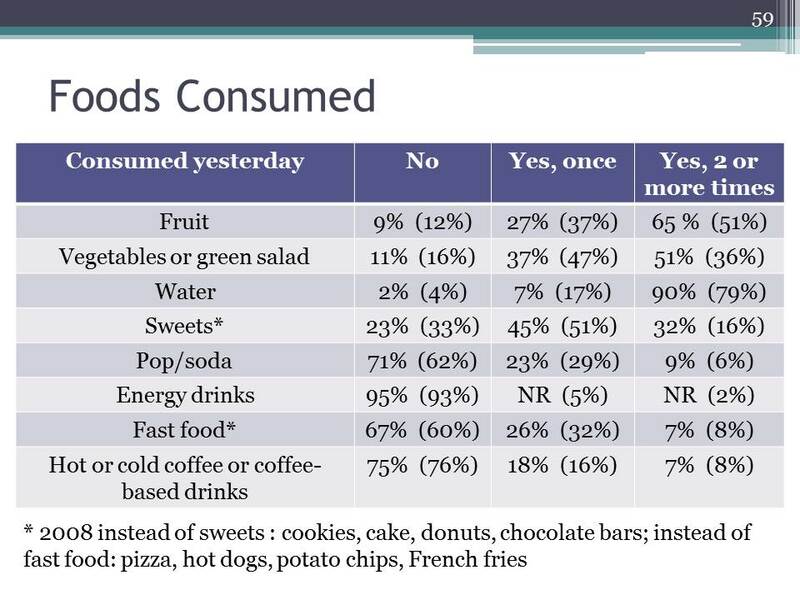 As with learning outcomes, we have to be careful when we talk in percentages. If four per cent of students are feeling unsafe, these numbers represent real children and anything below 100 per cent (feeling safe) tells us we still have work to do. We should be pleased with the story our young people are telling us and we can also take this as a clear message we need to keep doing what we are doing — our interventions are working. There are also other areas we must continue to focus on including mental health, a lack of sleep and physical activity. The Provincial BC Adolescent Health Survey is available on their website here. The McCreary Centre Society will also be producing documents for each of the 16 health service delivery areas. Of course, there are areas we still need to focus on and even in areas of strength, we must remain diligent. But, we do need to tell the story of our young people today and their health — it is a good story, an improving story and not just an observation. This past week I participated in the Network of Inquiry and Innovation (NOII) Symposium: Stories of Change: Pictures of Possibility. 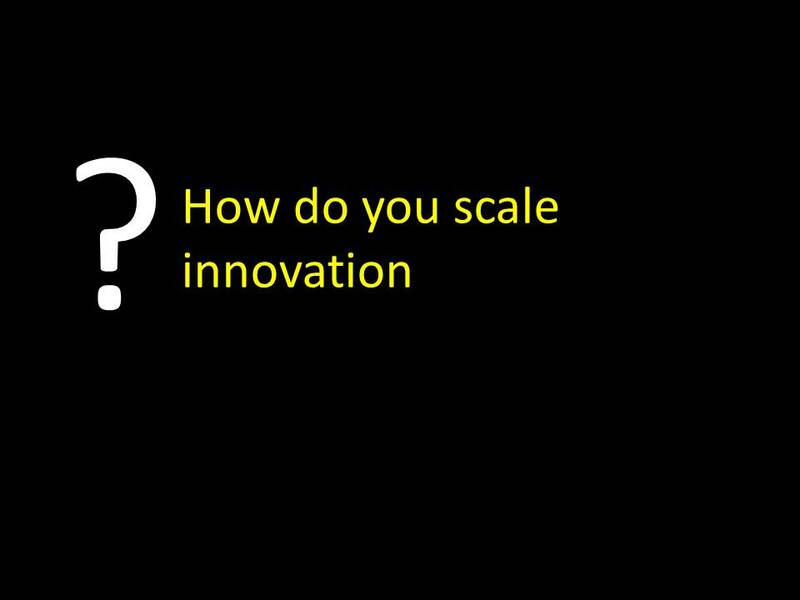 My presentation was entitled Innovation That Sticks – Real Examples from Real Schools. I think we can easily get caught up in the theoretical of what schools could be and fail to recognize the shifts occurring right in front of us. In our district (and I know of others), teachers and administrators are finding new ways to connect to students. The experiences for our students are quite different from even five years ago. 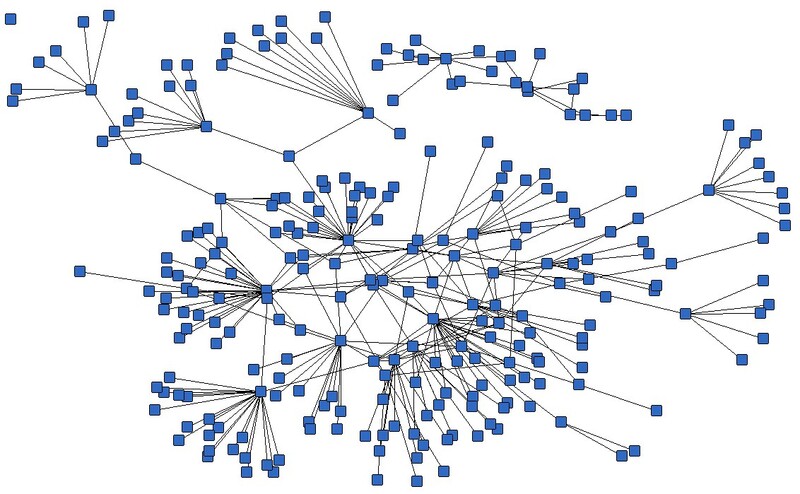 I have moved away from the language of “scaling our work,” to “networking our work.” We are not trying to create ‘sameness’ in our classes and schools; rather, we are trying to support the good work in one site by connecting it to the good work in another. I have written before about the power of networks in West Vancouver and British Columbia and I believe this is one of the characteristics that differentiates B.C. education from so many other regions — it is the connection across schools, districts, levels and disciplines — all focused on improving student learning. 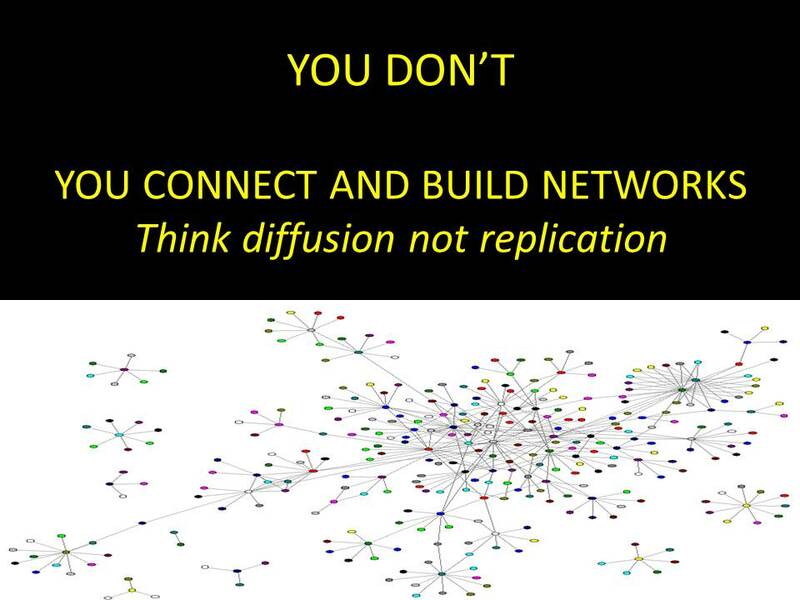 So, rather than seeking to scale work, our focus is on diffusion. At some point, there are so many connections with the ‘new’ they become the ‘normal’. We are seeing this with our inquiry work in West Vancouver on all levels — we have teachers embracing the PYP / MYP International Baccalaureate approach; others, use the Spirals of Inquiry as a basis of their work, while others use Understanding by Design to ground their approach. They are all taking similar approaches to learning and connecting to each other as inquiry-based learning has taken hold in all of our schools. The learners are as diverse as the learning, and while I know some would appreciate the simplicity of “just doing it all one way” we are finding huge power in the autonomy of teachers and schools as part of the new learning network. The work of innovation in our schools is not a program, it is not something we can announce, proclaim or implement. It is an ongoing shift to adjust our system to meet the needs of students in a way that is reflective of the world they are living in. The power of networks — connecting people and ideas as part of a community — is key to our story of success in West Vancouver.